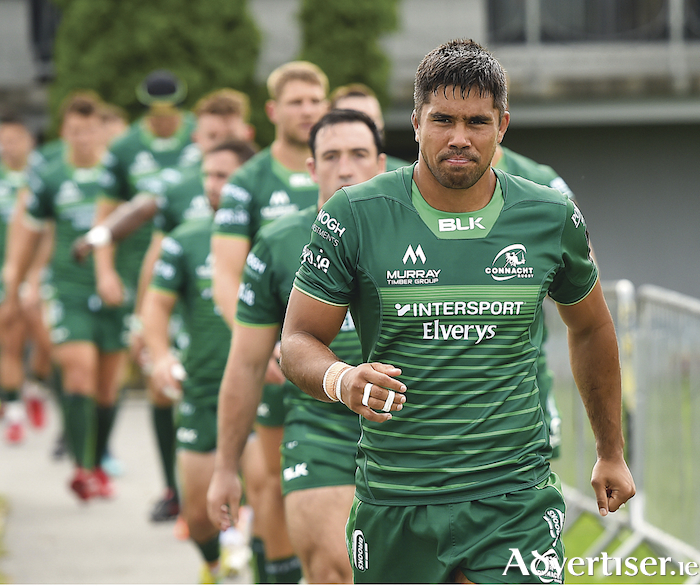 Connacht's Jarrad Butler has big boots to fill this season, having taken over the captaincy from the retired John Muldoon. Connacht open the 2018/19 Guinness PRO14 Championship campaign with a host of changes, but what remains the overriding goal is to qualify for Champions Cup rugby next season. Three pre-season games and a trio of wins is certainly a step in the right direction, while the addition of a host of quality players and the availability of new coach Andy Friend, now in his ninth week after a solid pre-season, all add to the current feel-good factor at the Sportsground this week. The visitors for a third successive season on opening day (Saturday 3pm ) are Glasgow, and they will certainly test Connacht's credentials. And it does not get any easier, with a return of Michael Bradley's Zebre and a visit to Edinburgh, before another two championship winners, Scarlets and Leinster, arrive in Galway. Friend says Connacht are in a "comfy spot" but they have yet to be tested in a competitive environment of the league. "We are now at the start line, it is what we do now we are here. We have a healthy squad, a good understanding about the way we want to play and it is now how we put that on the park, and make sure we turn those pre season wins into the competition." Friend, a former Australian Sevens coach, who has made Galway his "18th home in 23 years", remains committed to playing ambitious rugby, while also adding some "sevens" rugby to the mix. "What is important is that Connacht express themselves. They have an ambitious style, they play with real ambition and belief, and there are some really skilful footballers," he says. Certainly Connacht looked comfortable with ball in hand in pre-season. Good interplay and handling, energy and commitment, and communication, were the results of a profitable pre-season. Outhalf Jack Carty continues to gain in maturity, and he believes Connacht have the ability to not only qualify for Europe, but also make it to the semi-finals. "European football is the main goal, and this month of September is hugely important to us. We have a couple of home games and this first one against Glasgow is going to be a big test - massively important to us to show where we are. Initially we want to get into Europe and, if we are playing well, I can't see why we cannot make the play-offs. "We are an ambitious group, we've had a good pre-season, and if we get the ball rolling on Saturday, it will be a good step for the year." Ireland's Bundee Aki and Kieran Marmion are unavailable, but Tom Farrell, who stood out last season, has already formed a strong midfield partnership with new recruit Kyle Godwin. Cian Kelleher and Matt Healy have excelled in pre-season, while youngster Paul Boyle has shown his talent in the back row. New captain Jarrad Butler (ribs ), Eoin McKeon (shoulder ) and Sean O'Brien (calf ) missed last weekend's fixture due to knocks, Gavin Thornbury is back training (shoulder ), while it is likely to be too soon for Tom McCartney (ankle ) or new recruit Colby Fainga'a. Still to arrive is Sevu Reece, the Waikato winger from New Zealand, who is still involved in the Mitre 10 Cup. Of course, missing from this year's squad after 17 years is Mr Connacht, John Muldoon, now with Pat Lam's Bristol as an assistant coach. His boots will be hard to fill, but Carty believ's Muldoon's absence is a "huge opportunity for other players to express themselves in their leadership capabilities"- such as captain Jarrad Butler, Dave Heffernan, and Quinn Roux. Without doubt Connacht have matured as a team in the last two seasons, and some key signings have boosted the ranks. But Glasgow will be tough - winners in this corresponding fixture for the last two seasons. After a year in charge, coach Dave Rennie returns with greater ambitions for this Scottish outfit, and has placed considerable emphasis on the contact area in pre season. However, he is hoping the weather will be kinder than last season's opener at the Sportsground. "Worst conditions I have ever seen for a game of rugby - horizontal rain," he says. "Peter Horne had a shot at goal and it managed to go back over his head - however we managed to squeeze the win out. "It's a tough competition, Connacht are on our side of the draw, and you need to win away game to feature at the business end, so it's a big game for us. "We are in really good nick, it's hard to fire on all cylinders for nine months, so we have already selected our team for the next four weeks, and we need to transition our internationals back in when they are fresh. The former boss of the Chiefs, where Kieran Keane was his assistant, says he was surprised and disappointed with Keane's departure from Connacht after a season in charge, but believes Connacht will be better this season. "I feel for him [Keane] because I was lucky I made a commitment a year out, so I could influence contracts. We made 16 changes that year and I got to make all the decisions, along with our support staff. When you sign like KK did a little bit later, the team is picked for you and you are pretty much stuck with that group. "He was heavily involved in all the contracting for this season, and I think they will be a better team this year, no doubt. I just think if you ask someone to move across the other side of the world, you make a commitment to them and then a few months later tip them out and send them home, it's fair to say I was not impressed."